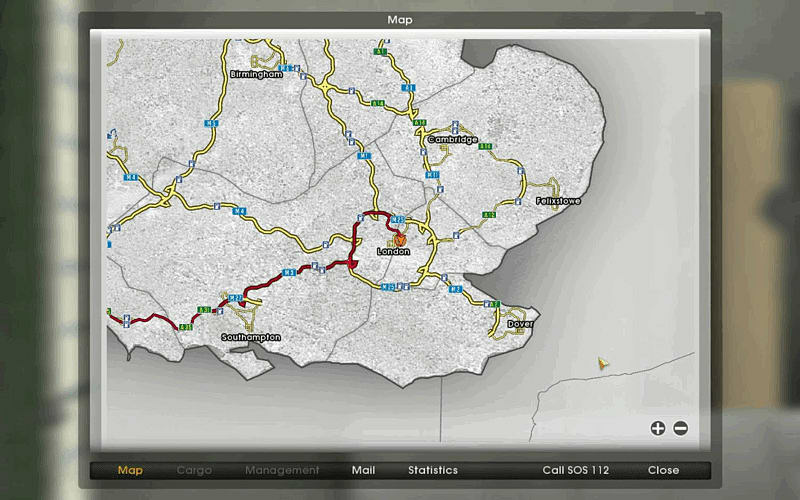 Hit the road in UK Truck Simulator! Using a network of motorways and major trunk routes you will gain unbridled access to 18 of the UK’s largest cities! Navigate your way around a realistic depiction of Europe travelling along major trunk routes and visiting famous places based on real roads and cities. Cities included are: London, Manchester, Liverpool, Aberdeen, Glasgow, Edinburgh, Newcastle, Carlisle, Sheffield, Grimsby, Birmingham, Swansea, Cambridge, Felixstowe, Dover, Southampton, Plymouth and Cardiff. Experiencing the life of a UK haulage contractor you can visit all the major cities of the UK. You will need to make sure you make your deliveries on time, keep your truck in good repair and check your fuel consumption. Build up your business and upgrade your truck to keep your business running efficiently and profitably. Watch out for the “Kojak with Kodak” as traffic violations will be deducted from your earnings, and you know how expensive that can be!! Must have excellent driving record, good business skills and the “drive” to succeed! Experience the life of a long distance truck driver as you face the challenge of varying road and weather conditions and meeting the demands of a heavy schedule. Choose your truck – there’s a wide variety to suit all budgets! Maximise your business potential by choosing the best you can afford. This truly immersive environment allows you to pan around the cabin and check your rear view mirrors, just like actually sitting at the wheel! - Each of the trucks are based on European design and have meticulously detailed 3D interiors. - Collect your earnings when you arrive at the depot, fines for traffic violations will be deducted however! - Make sure you carry out repairs and refuel when necessary to keep your truck roadworthy, why not upgrade or buy a new truck when you can afford to do so. - Spread your business into different countries. Carrying dangerous goods pays well but you must also get your license.